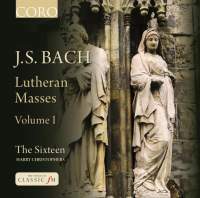 Appréciation d'ensemble/ Evaluation : "a very successful disc"
That the four so-called Lutheran Masses of J. S. Bach are very much overshadowed by their far bigger brother, the great B minor Mass, is both inevitable and, in some respects , unwarranted . These relatively modest works consist of concerted settings of just two parts of the Mass Ordinary, the ‘ Kyrie’ and ‘ Gloria’ , in keeping with contemporary liturgical practice and perhaps intended for those occasions when something a little more special than usual was merited. Lesser works by stature they may be, but they are nevertheless compositions of fine craftsmanship, full of the best music. A good deal of this music Bach purloined from cantatas that he had written earlier, but their status as parody Masses can hardly be frowned upon when so much of the B minor Mass too was reclaimed by Bach from earlier material. In choosing his resources, Harry Christophers has opted for a slim line-up of solo singers with voice parts doubled in the choruses. This is now a fairly commonplace and very effective way of maximizing the suppleness and clarity of solo singers while retaining for the tutti something of the collective timbre of a fuller choir, and it allows him to do things that even with a top-notch outfit such as The Sixteen just can’t be done quite so well with a larger group. Had other projects not intervened, the result might have been very different - in his booklet introduction, Christophers writes with relief of a never-realized recording with full choir. The earlier recordings by the Purcell Quartet on Chandos, which set the standard high back in the 1990s, sound positively skeletal by comparison with this new disc, using not only solo singers throughout but solo players too, thus paring down even the orchestral texture to the absolute minimum. The Sixteen’s orchestra has a larger string band at its core, producing a fuller-bodied, lustrous sound. The cantata BWV102, Herr, deine Augen sehen nach dem Glauben, which is programmed between the two Masses, supplies the foundation of several of the Mass movements, but it’s just one link in a chain that involves several source cantatas. 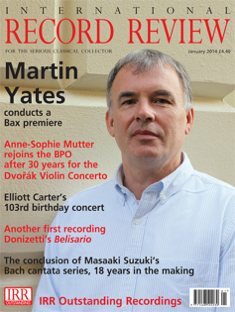 It has a particularly fine opening movement, ‘one of the great achievements of the mature Bach’ , according to the leading authority Alfred Dürr; no wonder, says Christophers, Bach wanted to reuse it. Or perhaps, more practically, Bach merely found a convenient tripartite structure that, with not much more than a few verbal tweaks, could be quickly converted to another use. Comparing like for like, which is easily done with this disc (but not with the Chandos recordings), is a fascinating way of peering over Bach’s shoulder as he works, for the parody process, once dismissed as a sneaky shortcut for hard-pressed composers, is full of interesting compositional choices. The degree of change in such attributes as scoring, key and embellishment varies considerably; an extreme example is the ‘Quoniam’ of the F major Mass, in which the instrumental obbligato from the cantata aria ‘Erschrecke doch’ remains intact but is coupled with a virtually new vocal line. It’s a continuing process of renewal and improvement and, interestingly, Christophers extends the parody through performance, changing tempos and shifting emphases in an effort to achieve the ideal alignment of music and text; the opening chorus of the G minor Mass, for example, he makes more than half a minute longer than its cantata analogue. Both the performances and the re sound are clear and crisp, with a fairly light bass end and excellent definition all round. The Chandos recordings are brighter and, using soloists throughout, more closely recorded. The Sixteen’s singers acquit themselves superbly and, particularly impressive, throw off the exacting passagework in fast movements with crystalline sparkle. Robin Blaze reprises his role in the G minor Mass, having appeared for Chandos in 1998 and evidently having lost little by way of youthful exuberance in the meantime. A decent background essay and full texts and translations complete a very successful disc. A companion volume containing the two other Masses and a linking cantata is due for release in 2014.